At the leadership of a party that has chosen to avert disputes by allowing its members to make an independent choice on who to support in Egypt's upcoming presidential elections, Ehab El-Kharrat has defied the general Coptic consensus within the Egyptian Social Democratic Party (ESDP) — and indeed the Christian community as a whole — and endorsed Hamdeen Sabahi. El-Kharrat is aware that his decision to go against overwhelming Coptic support for Abdel-Fattah El-Sisi is a high political risk. “It will sure make me unpopular within the Coptic ranks in general, but still I am convinced that it is Sabahi that I have to vote for,” he said. The choice of El-Kharrat is not linked to Sabahi’s position on Copts, unlike that of El-Sisi supporters who argue that the former army chief and now presidential runner is the one who successfully removed the Muslim Brotherhood from office and thus the one who can spare Copts from the feared wrath of radical Islamic groups. “I chose Sabahi as an Egyptian citizen, irrespective of my religion ... [I believe] he is the better candidate and that he has the better vision for the future,” El-Kharrat said. According to El-Kharrat, Sabahi has “a compact vision for the future that is even better than what he had offered as a presidential runner in the 2012 race,” which ended in June of that year with the inauguration of now ousted Mohamed Morsi, candidate of the Muslim Brotherhood via its political arm, which is still legal, the Freedom and Justice Party. A key point, El-Kharrat states, is that Sabbahi, himself a long time opposition figure with leftist leanings, supports the right to demonstrate. “This is not the case with El-Sisi, who is apprehensive on the right to protest and who unlike Sabahi is not open to adjusting the protests law” passed under the rule of Interim President Adly Mansour, despite the outcry the law has caused. The second point that brought El-Kharrat to the camp of Sabahi is the latter's respect for social justice and the struggle of workers. “Sabahi, unlike El-Sisi, seems well aware that these protests are made by workers who lament the poor administration of the factories they work in and who wish to see better and more advancement management and not just better workers’ rights. He knows where the workers are coming from,” El-Kharrat said. “What Sabbahi is offering is a scheme that was successfully adopted in the Netherlands and that could help expand agricultural space in an effective and non-bureaucratic fashion,” El-Kharrat suggested. As a Copt, meanwhile, El-Kharrat believes, “despite all that is being said,” that “it is Sabahi rather than El-Sisi” who could offer a better future of safety for Copts in Egypt. “Simply, he is not offering to be the saviour of Copts but is arguing that the law will be the saviour of all citizens, including Copts — just like others." El-Kharrat is aware that the overwhelming Coptic vote is going the way of El-Sisi. He is not ignoring the warm and long applause that the former army chief received during Easter Mass just a few weeks ago. El-Sisi had visited with the Coptic Patriarch hours before the mass, while Sabahi did what he and other presidential runners had done during the 2012: attended the mass. Still, upon his arrival to the gates of the Coptic Cathedral in Abbasiya, and a little to his surprise, Sabahi was met with chants of “Sabahi go home, we are voting El-Sisi." In the 2012 electoral race, Sabahi received but a small share of the Coptic vote, mostly from the youth and revolutionary quarters, while the majority voted in favour of Ahmed Shafiq, who was supported by the leading fathers of the Coptic Church, followed by Amr Moussa. In the second round, between Shafiq, the last prime minister of ousted president Hosni Mubarak, and Morsi, the Coptic vote was predominantly in favour of Shafiq, with Coptic groups and figures sending messages for Copts to "go vote for Shafiq to save the country from falling in the hands of the Muslim Brotherhood." “It was unfortunate what happened then, because it was a replay of the bad old scenario we lived during the years of Mubarak, whereby Copts had to hide from the Islamists behind the ruler — even if a dictator,” El-Kharrat said. Today, while many Coptic groups and figures are insisting that Sabahi is "fully supported by the Muslim Brotherhood" who will seek to "fail El-Sisi" by voting for his adversary, El-Kharrat is confident that reality is otherwise. Sabahi had been at the forefront of opposing the rule of the Muslim Brotherhood, cofounding the National Salvation Front after Morsi's controversial constitutional declaration in November 2012 that put his decisions beyond judicial review. Sabahi's Popular Current was also key to the launch of the Rebel (Tamarod) campaign that picked up on the strong anti-Morsi mood and culminated in the 30 June demonstrations that allowed for El-Sisi to intervene and remove Morsi. The Muslim Brotherhood perceive Sabahi and the rest of the National Salvation Front as full partners in the end of their rule, which was ultimately executed by the former army chief. 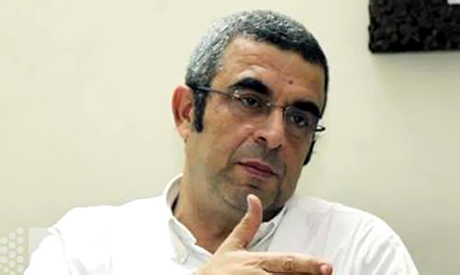 “But people are too hijacked by the bad memories of the aggressive speech that the Morsi regime allowed against Copts, and of course they are also still hostage to the negative ideas embedded in the minds of many during the Mubarak era, which makes many Copts think they are only secure if there is a dictator who is coercing Islamists,’ El-Kharrat argued. He added: “Well, I don’t happen to think this way. I don’t want anybody coerced. I want a real democracy whereby all citizens would be equal by power of law and not by the decision of any leader." Moreover, El-Kharrat reminded that Copts have to take the promises of El-Sisi with a bit of realism. He said: “Let us remember that El-Sisi had promised that all the churches and other Coptic institutions that had been attacked since the ouster of Morsi, in total over 80 places, would be fully restored by the state. But in fact this has not happened and only a few have been restored by donations” of individuals and members of the business community. In any event, El-Kharrat was not — nor is he now — hoping to see the state get too involved in matters related to the construction or reconstruction of churches. Places for prayer should be entirely a matter for society, he says. The role of the state is related to regulations and laws rather than direct involvement, he argues. But Copts are too scared to think this way. Indeed, they are scared enough, he says, to overlook the fact that El-Sisi was member of the then ruling Supreme Council of the Armed Forces (SCAF) when Coptic demonstrators in October 2011 were attacked and some killed by impulsive soldiers who were trying to disperse a Coptic rights protest — known as the Maspero incident. But El-Kharrat recognises that support for El-Sisi has swept the entire nation. “It is not just about Copts; the largest part of Muslims are also favouring El-Sisi. This is evident." El-Kharrat is not particularly hopeful that Sabahi has a serious chance of beating El-Sisi. But he is convinced that still, "it is important to stand up and say that we choose to support the man who is offering the state, rather than the leader, as the saviour."